During an early wedding scene involving Ron’s oldest brother Bill (Domhnall Gleeson) and Fleur Delacour (Clémence Poésy) there is a sudden message that the Ministry has been overtaken. 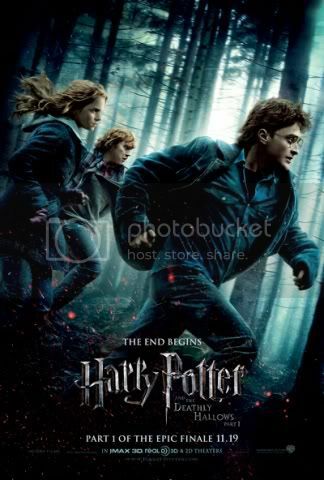 Soon Death Eaters are scattering the guests, and Ron, Hermione, and Harry must disapparate to safety. They find themselves in crowded Muggle streets, but they aren’t safe even there, having been mysteriously pursued by Death Eaters. Soon they’re on the run, across the vast landscapes of Great Britain. 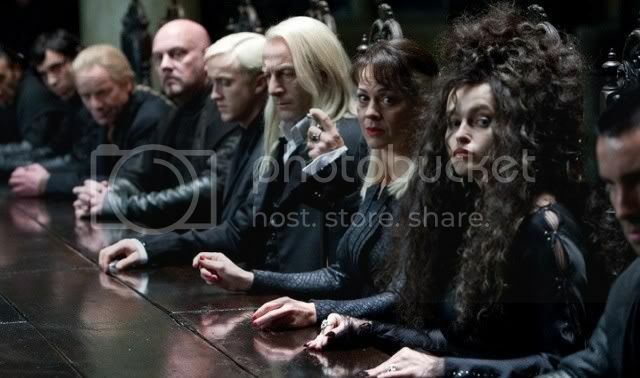 They set up camp, cast protective spells, and listen for any news of the Order’s attempts to thwart Voldemort’s plans. At the same time they become obsessed with finding the Horcruxes into which Voldemort has split his soul. These are the key to the only way in which they might be able to eventually finish off the most evil wizard to threaten their world. A number of important scenes from the first section of the book make an appearance. 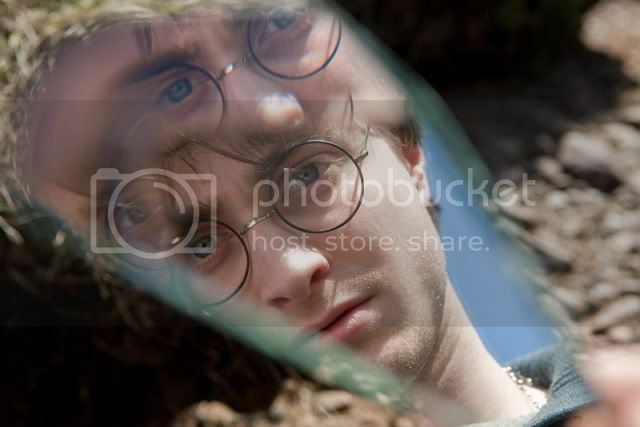 There’s a visit to Godric’s Hollow to see Harry’s parents’ graves, and a vital scene in the woods involving a cold lake. As part of Ron’s worst fears is realized by an evil mist, there’s a brief moment where a digitized Harry and Hermione make out, mostly (or all) naked. It sounds a bit odd, but actually works rather well in context. A number of secondary and tertiary characters make necessary appearances, including Xenophilius Lovegood (Rhys Ifans) and his daughter Luna (Evanna Lynch). The elves Kreacher (Simon McBurney) and Dobby (Toby Jones) also fulfill essential roles. Hogwarts is barely mentioned in the film, and there is only a brief scene involving the Hogwarts Express as Death Eaters search it for Mudbloods. If this plot description does not make much sense, then the movie probably won’t either. It is deliberately told for those familiar with the material, and it is a stronger movie as a result. It wastes little time or effort on explaining the goings-on of the Wizarding world, allowing more time for the story to unfold. One of the strong points is the way the trio’s wanderings are depicted. In the book it drags on interminably, but here it is presented quietly and atmospherically. It is clear that they are miserable and listless, and a combination of long, slow shots helps reinforce this mood. This section may drag for some viewers, but for me it was highly effective at expressing an essential part of the story. Other segments involve much different directorial flourishes. Three-time Harry Potter director David Yates manages to keep the film flowing by varying technical elements. A chase through the woods involves jerky handheld cameras that move with the characters, evoking their sense of disorientation and confusion. This is an estimable use of such a technique. Another sequence, in which Hermione reads the story of the Deathly Hallows, involves animation so fluid and haunting that, if it were presented on its own as a short film, would be worthy of an Oscar nomination. Generally, however, the directing is kept low-key, allowing the characters to follow their prescribed paths. Fans of the series should enjoy Harry Potter and the Deathly Hallows: Part 1, as it successfully adapts the necessary portions of the book and adequately excises the fat. It is alternately exciting and brooding, though it ends at a point that is less climax than the calm before the storm. The primary actors are even more polished than they were previously, and the supporting cast reads like the Hall of Fame of British actors. With this film as the set-up for the best portion of the best book in the series, it will be difficult to wait until next July for Part 2.
cartierlovejesduas I have really enjoyed reading and learning from all this shared wisdom. Thanks+ACE- I write out my sermons. In fact, its a deeply spiritual experience. I would even call it a spiritual discipline +IBM- silence, solitude, reading, meditating, journaling, praying, to name a few. I carefully choose every word knowing that God can and has overruled those words during the presentation. With the use of film clips, PowerPoint slides and note pages provided for the audience it becomes more important to follow a clear plan. Add to this multiple services. But for me, one of the added values of preaching from a manuscript is that 6 months from now I know what I said. And so, when a member or someone who watched our service online asks about something from the sermon, I can speak to the issue with some degree of certainty. And who knows, some of those carefully chosen words might find their way into a conversation, a letter, an article or even a book. Case in point, this past week a woman called asking my thoughts on tithing. I could have talked to her after a few seconds of thinking, but I knew that a couple of years ago I gave 20-30 hours of thought to the topic in a sermon. So, during our conversation I pulled it up on my laptop and I think I was much more helpful to her. They were my thoughts, but they were not my random thoughts.